Hello! Me is back with a new introduction of a neighbour on the Dutch Sesamestreet: Pino. Me mentioned Pino before during the Dutch alphabet (remember P is for…), but now me will properly introduce him. Pino (you pronounce it as Pee-no) is a very big, blue bird. He is the cousin of Big Bird. Pino has colourful feathers on top of his head. He may be tall and a goofball, but he is just a little kid too. Pino is only four years old. Pino likes to play with Tommie and Ieniemienie. They are the best friends, but sometimes they outsmart him because of the age difference. He used to sleep in a big nest – me loved that – but after the street got renovated he lost his nest and now he sleeps at the beach. The big bird may be blue, but he has a uplifiting spirit. He likes to sing, play and use his imagination. Also he loves to cuddle. He likes to cuddle and play with Purk (a baby piglet me will tell more about next time). Pino is very sensitive, but that makes him so loveable. He loves to giggle a lot. No body giggles like Pino. And he is known for his catch phrase: ‘Echt waar?’ (Really?). Me love Pino and his friends. On Youtube you can watch him sing or play. 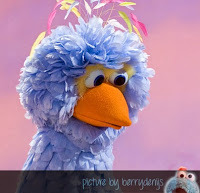 Make sure to search for Pino and Sesamstraat and just enjoy this feathery and blue cutee on Dutch Sesame Street.